This 14th Century Gothic Medieval Sword is inspired by the original, currently on display at the Royal Ontario Museum. This 14th Century Gothic Medieval Sword is inspired by the original, currently on display at the Royal Ontario Museum. An almost identical sword is on display at the Metropolitan Museum of Arts. With the advent of heavy armor, this Gothic Medieval Sword was an innovation in functionality. While the wide blade was used to break through armor and wound opponents, the heavily tapered tip of the sword was designed to pierce armor gaps. Given the functional aspects of the Gothic Medieval Sword, This blade type become of common use throughout Europe during the 14th & 15th C. The 14th Century Gothic Medieval Sword, commonly known as a Dagesse sword, is a faithful reproduction of the popular cut and thrust battle ready sword. The diamond shaped blade, wide at the shoulders, with a heavy tapper to the narrow tip, brings the point of balance back for excellent tip control. The guard and pommel are made of solid brass, as is the original in the Royal Ontario Museum. 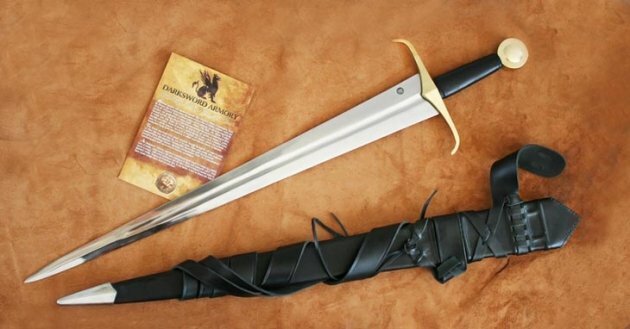 A unique take on the traditional arming battle ready sword.